McKENNA, Joseph, a Representative from California; born in Philadelphia, Pa., August 10, 1843; moved with his parents to Benicia, Calif., in January 1855; attended the public schools and was graduated from the law department of Benicia Collegiate Institute in 1865; was admitted to the bar in 1865 and commenced practice in Benicia, Calif.; moved to Fairfield, Solano County, in 1866 and continued the practice of law for eight years; district attorney of Solano County 1866-1868; member of the State house of representatives in 1875 and 1876; unsuccessful Republican candidate in 1876 for election to the Forty-fifth Congress and in 1878 to the Forty-sixth Congress; elected as a Republican to the Forty-ninth and to the three succeeding Congresses and served from March 4, 1885, to March 28, 1892, when he resigned; appointed by President Harrison as United States circuit judge for the ninth judicial circuit February 11, 1892, and was confirmed March 17, 1892; served five years and resigned; appointed Attorney General of the United States in the Cabinet of President McKinley and served from March 7, 1897, to January 25, 1898, when he resigned, having been appointed by President McKinley as an Associate Justice of the United States Supreme Court January 26, 1898, to succeed Justice Stephen J. Field, and served from January 26, 1898, to January 25, 1925, when he resigned; died in Washington, D.C., November 21, 1926; interment in Mount Olivet Cemetery. Papers: In the Stewart A. Blanc miscellany, ca. 1867-1918, 1 folder. The papers include an undated Sunset Telephone and Telegraph Company form with a message from Judge McKenna in San Francisco to General Benjamin Harrison at Stanford University, inquiring about Harrison's schedule for arriving in Oakland, with a reply to McKenna from Harrison. Papers: 1911, 5 sheets. Shorthand notes written by Joseph McKenna of an opinion regarding certificates of allotment of property given out by a town and typed transcription. Portrait: ca. 1898-1925, 1 portrait. A oil on canvas portrait of Joseph McKenna, Associate Justice, United States Supreme Court, 1898-1925. Photograph: ca. 1906, 1 photograph. Joseph McKenna, Associate Justice, Supreme Court, full-length portrait, seated, facing right. Photograph: ca. 1909-1924, 1 photograph. Justices of the Supreme Court at work and play, Associate Justice Joseph McKenna (left) on the links with former Justice Pitney. Photograph: ca. 1925, 1 photograph. Joseph McKenna, Associate Justice, Supreme Court, posed in the study of his Washington home, surrounded by his law books, with his successor, Harlan Fiske Stone. The photograph is from the studio of Underwood & Underwood. Papers: In the Albert Henry Walker correspondence, 1882-1913, 17 items. Correspondents include Joseph McKenna. Photographs: In the Group portraits of members of the United States Supreme Court: photographic prints, ca. 1925-1940, 3 photographic prints. Persons featured include Joseph McKenna. The photograph is from the studio of Harris & Ewing. Papers: In the Joseph C. Rowell Correspondence: Additions, 1880-1933, 1 portfolio. 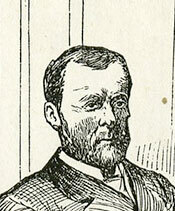 Correspondents include Joseph McKenna from March 15, 1890. Papers: In the Waterman family papers, 1839-1906, 28 linear feet. Correspondents include Joseph McKenna. McDevitt, Matthew, Brother. Joseph McKenna: Associate Justice of the United States. Washington, D.C.: The Catholic University of America Press, 1946. Reprint, New York: Da Capo Press, 1974.